Details have emerged that Nana Owusu Ensaw, a former chairman of the finance sub-committee of the Board of the National Communication Authority was not aware of plans to purchase a cyber security system for the National Security Council Secretariat to tackle terrorism. According to the case investigator, Chief Inspector Michael Nkrumah, Nana Ensaw, who is on trial with the former NCA board chairman and three others, consistently maintained that he only got to know about the payment of $4 million to Infralocks Development Limited (IDL), the reseller of the equipment, after the deal had been concluded. Chief Inspector Nkrumah told the court that Nana Ensaw said he never took part in any meetings at NCA on the purchase of the controversial equipment. Chief Inspector Nkrumah disclosed this under cross-examination by Samuel Codjoe – lead counsel for Nana Ensaw. Lawyer: A3 (Nana Ensaw) in his statement to you has always mentioned that he only got to know of the payment of $4 million as institutional support after it had been done. Isn't it? Lawyer: And this is because you in your investigations and in your evidence in court you have consistently informed this court that the issue about the purchase of the Pegus equipment never came to the board. 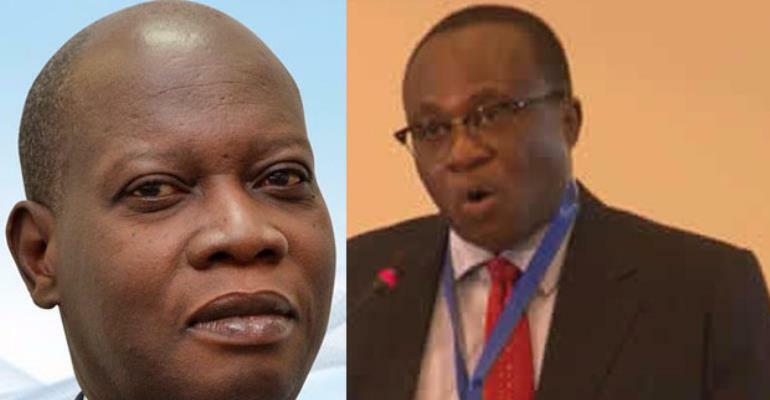 The court also heard during cross-examination of the investigator, which lasted for almost four hours, that apart from Mr. Baffoe-Bonnie's 'confession' statement, the investigator said he did not have any other evidence that the accused persons benefitted financially from the purchase of the equipment. The investigator told the court that Mr. Baffoe-Bonnie, in his police caution statement, mentioned that $500,000 was given to Nana Ensaw to share among Mr. Tetteh-Tevie, Alhaji Mimina Osman and himself. But under cross-examination yesterday, he confirmed that the only evidence to back that claim is the 'confession' statement. Lawyer: But at least what is certain and unambiguous is the fact that save the statement of A1 (Mr. Baffoe-Bonnie) allegedly instructing A3 (Nana Ensaw) to collect the sum of $500,000 and distributing them to A2 (Mr. Tetthe-Tevie) and A4 (Alhaji Osman), you Inspector Nkrumah and your entire team do not have any evidence showing these payments and receipts by A2 and A4. Investigator: My Lord the evidence we have is A1’s statement. Lawyer: Apart from the statement, you and your entire team don’t have any evidence of payment. The investigator also confirmed to the court that Nana Ensaw provided proof of payment for a contract he executed with Huawei Technology Limited. He, however, corrected the statement yesterday, saying his attention was later drawn to the fact that the accused person provided proof of payment by way of a bank statement. The cross-examination continues on April 11.